On Friday 25 August, Saturn a.k.a. The Lord of Karma (I wish my childhood nickname was that cool) ends its four-month-plus retrograde, lurching forward once again in truth-telling Sagittarius. With Saturn getting back on track, the pressure that many of us have felt over getting our plans, structures, and systems of organisations done just right should start to ease a little. After the peak intensity of eclipse season on Monday 21 August, we’ll take any break we can get. On Saturday 26 August, love + partnership planet Venus sashays into Leo and HAWT DAMN, PEOPLE. This is a great time to get creative in your undertakings (Venus rules beauty and Leo brings the drama), and even a little aggressive in the pursuit of love! Go on. You know you want to. Text the hotties. TEXT ALL THE HOTTIES. Saturn also forms a sextile with Jupiter on Sunday 27 August, injecting a dose of hope, resilience and luck into the proceedings. This is a good time to cosy up to a client or get some serious work done while everyone else is resting, if you enjoy working on weekends. Mercury is still retrograde, though, so be sure to back up all your files + proofread before hitting Send. 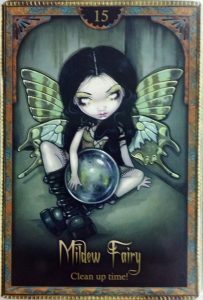 Our Weekend Oracle card is the Mildew Fairy: it’s clean-up time! When this card appears, it’s likely that some aspect(s) of your life are growing stagnant and need some loving attention. This could refer to feeling emotionally stuck and/or intellectually uninspired, and would necessitate a fresh new approach to things. For some of us, this advice could be literal: check your living + work spaces for signs of mould, rot, or simply dust piling up. You need a healthy and aesthetically decent-looking environment to perform well in, so get cleaning!